Along with the other students in the Public Art/Architectural Art Certificate Program, I was awarded an internship at the Master Craftsman Studio at the beginning of the 2013 fall semester. When the time came to decide my internship for this summer, it only felt natural to continue my work at MCS, as I have been there for about the past year, and I have come to greatly enjoy the position I have been so lucky to receive. 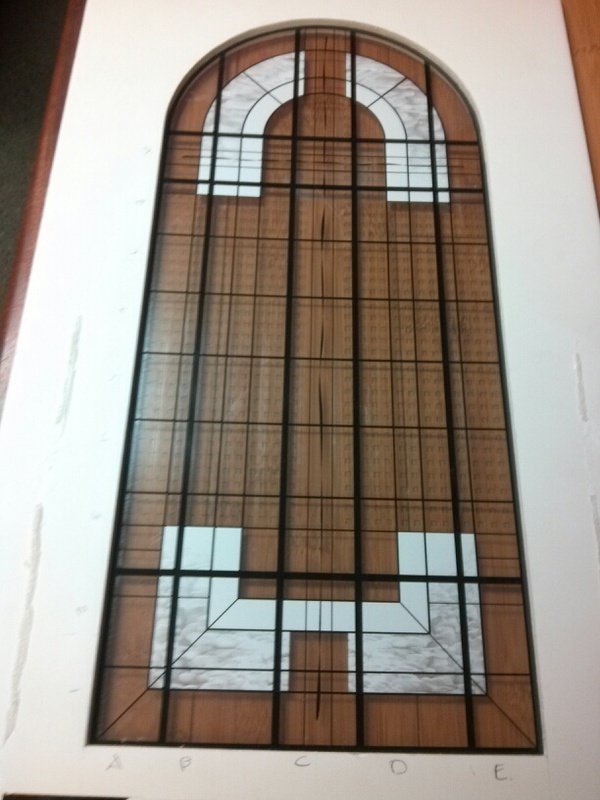 Currently, amongst other projects, we are intently working on a series of rather large stained glass windows for the Belmont University in Tennessee. 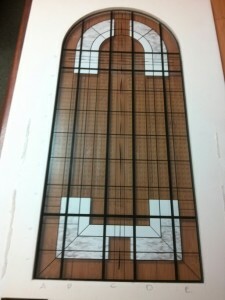 This project consists of six, separate, twelve foot by twenty-foot windows. Since they are identical, the process for their creation is to fabricate small sections, six at a time, then assembling the pieces to form each of the complete windows. There are ten people including myself, coworkers, out of state professionals, and other interns in the studio assisting on this project. Glass cutting, cleaning, and leading the armature, are among the tasks that this project calls for; and multiple hands are needed on each at all times in order to meet the deadline scheduled for July 14th. It has been a long-term dream of mine to practice art in the public arena, as well as work in a fabrication studio for my career. Needless to say, I am more than grateful to have been able to achieve one part of my life goals already, and I feel confident that I am well on my way to succeeding in the second. Throughout the past year I have acquired an enormous wealth of knowledge and experience that I would not have gained anywhere else than MCS. Just this summer, among numerous other things, I have learned and participated in the process of creating large scale stained glass windows, how to laminate glass with dichroic film, operate a vinyl cutter, and create molds for glass slumping. I could honestly fill the entire page listing all the different crafts, skills, processes, mediums, and information I have gained over the past year while interning at MCS. I have nothing but the highest praises for the Public Art/Architectural Art Certificate Program, and everyone at the Master Craftsman Studio. As I am nearing the end of my time in the program, and my interning at the studio, I can only hope that these incredible opportunities are able to keep manifesting. I would love nothing more than to continue my work at MCS for the foreseeable future, and I would highly suggest to anyone to get involved with both the program, and the studio, if interested.